Loose Caboose Video Slot Guide & Review - Casino Answers! Loose Caboose is a 5-reel, 25-line video slot developed by Realtime Gaming, featuring a wild substitute symbol, scatter wins, a free spins feature and a progressive jackpot. 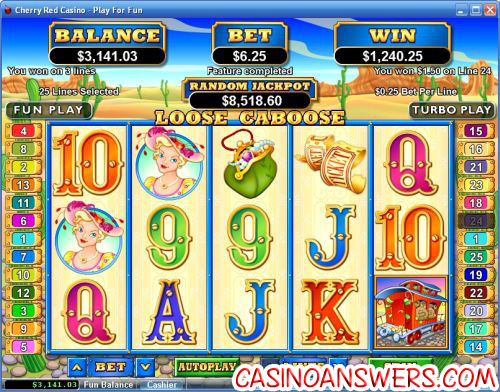 You can play the Loose Caboose Real-Series video slot at USA-friendly casinos Lucky Red Casino and Slots Oasis Casino. Bets on the Loose Caboose slot machine are $0.01, $0.02, $0.03, $0.04, $0.05, $0.06, $0.07, $0.08, $0.09, $0.10, $0.25, $0.50, $1, $2.50 and $5 per line. You can select from 1-25 lines on a spin in Loose Caboose. Loose Caboose has a wide betting range from a penny per spin up to the highest total bet of $125. With this kind of betting range, it doesn’t matter if you like to bet low or bet high, you will find a suitable bet to play on the Loose Caboose online slot. If you want, you can manually skill stop the reels by hitting the “Stop” button in mid-spin. To play Loose Caboose, press the “Spin” button. The highest paying symbol on the Loose Caboose video slot is the Engineer symbol. If 5 Engineers land on the reels, you will win the 5000 coin top fixed jackpot. The Engineer is a wild symbol and will substitute for all symbols in Loose Caboose except for the Scattered Caboose symbol. Other high paying symbols on the Loose Caboose slot game are the Locomotive (2500X), Conductor (1000X) and Passenger (1000X) symbols. The Caboose is the scatter symbol on Loose Caboose. It will pay out 1X for two symbols up to 200X your total bet for five scatter symbols. When three or more scatter symbols show up on the reels, you will trigger the Cash Train feature. The Cash Train will move across the top row of the video slot to reveal free game amounts, multipliers and bonus symbols. The Cash Train may also run across one or both of the rows below for more free spins, multipliers and bonus symbols. During the free spins feature, bonus symbols that appear will act as wild symbols. If you re-trigger the Cash Train feature, you will receive 5 additional free spins. Free spins are played at the lines and bet of the triggering game. From personal experience, we can tell you that the Cash Train feature can win you thousands of dollars in winnings at Lucky Red Casino! The Cash Train feature is not the only way to win big on the Loose Caboose video slot. You can also win the Loose Caboose progressive Jackpot. At the time of this writing, it is over $9,100. It is won randomly, so you can win it now simply by playing. You don’t even need a winning spin to take this home in your luggage. Progressive Jackpot wins are added to other wins. Random Jackpot contribution is no more than 1.5% of total Return to Player. Hit the “Autoplay” button to open the autoplay settings. You will be able to set the number of spins, set it to stop when the jackpot is won, stop if a win exceeds or equals (any amount you input), stop on any win, stop if your balance increases/decreases by any amount you input and stop once the feature is triggered. You can stop the Loose Caboose autoplay mode using the “Stop Auto” button to deactivate it. Turbo Play can be found in the autoplay settings. The highlight of the Loose Caboose is the Cash Train feature, but that’s not all the slot game has. There’s also a progressive jackpot and some good regular payouts as well. Of course, if you’re into trains, you will enjoy playing the video slot due to its theme, regardless of some of the special features. If you’re not particularly into trains, you’ll still have fun playing the Loose Caboose video slot for the Cash Train feature. To play the Loose Caboose video slot, we recommend you sign up and deposit at Lucky Red Casino! How can I win the Loose Caboose progressive jackpot? The Loose Caboose progressive jackpot is random and can be won at the conclusion of any spin you make on the Loose Caboose online slot. To better your odds of winning it, try increasing your bet per line. Are USA players able to play the Loose Caboose slot machine for real money? Yes, American players can play the Loose Caboose video slot at Lucky Red Casino and Slots Oasis Casino. Where can I play other train-themed video slots? 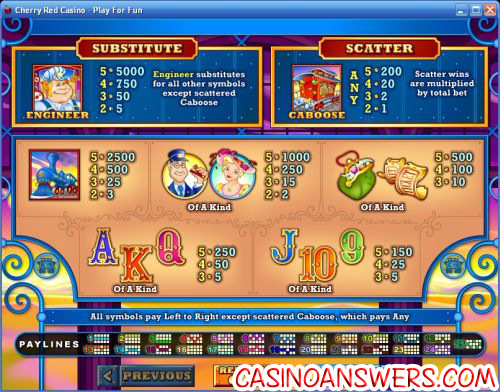 You can also read our All Aboard Video Slot Review which you can play at Vegas Days Casino. It is another USA-friendly video slot, so players from the United States can play both Loose Caboose and All Aboard. For more information on Vegas Days Casino, please read our Vegas Days Casino Review. Is there a Loose Caboose Flash game that I can play anywhere? While there isn’t a Loose Caboose Flash game at Lucky Red Casino, you can play a Flash game of the All Aboard video slot at Vegas Days Flash Casino.